News and opinion on India's defense modernization; a veteran's perspective. Jet fighters began to be equipped with airborne radars in the early 1960's. Radars provided better detection capability than human eyes and facilitated guidance of air to air missiles which could be used to attack enemy fighters at ranges considerably larger than the few hundred yards that aircraft cannons were effective up to. Early jet fighter, like the MiG-21, employed mechanically steered concave reflector antennas colloquially referred to as dish antennas. A concave reflector antenna is a simple and effective solution for generating a shaped radar beam as well as efficiently gathering any reflected energy from it. Dish antennas, however, have their limitations. Their to and fro steering mechanisms are expensive to fabricate to the high accuracies required. Such steering mechanisms are also prone to frequent failures. In other words they have a relatively short Mean Times Between Failure (MTBF) of around 60 to 300 hours. Another problem with dish antennas radars is that they have fairly large side-lobes which leads to signal losses and reduces their sensitivity. Finally, dish antennas do a good job not just of shaping their transmitter beams and gathering reflected energy from it but they are equally efficient at reflecting radar energy from enemy radars! In other words they are as good with detecting the enemy as they are with letting the enemy detect them. Initially jet fighters were equipped with airborne radars purely for air to air combat. As long as the threat that a fighter aircraft was attempting to counter were enemy fighter aircrafts, first generation radars with dish antennas were effective. However, the introduction of long range cruise missiles by the former Soviet Union in the 1970s changed the equation dramatically. The smaller size of the cruise missile, and the consequent reduced radar signature gave cruise missiles a good chance of penetrating the fighter air cover over US carrier groups and hitting home with devastating effects. In order to effectively engage cruise missile the detection and guidance capability of an airborne radar needed to be stepped up dramatically. As the threat evolved so did airborne radars. In order to reduce the sidelobes associated with dish antennas as well as reduce their reflectivity planar or slotted array antennas began to be developed in the 1970s. Planar array antennas, like dish antennas, are also mechanically steered but they use a flat rather than concave receiver to gather the reflected radar energy. A flat panel reflector scatters the radar energy impinging on it from hostile radars, rather than sending it back as a well focused beam. 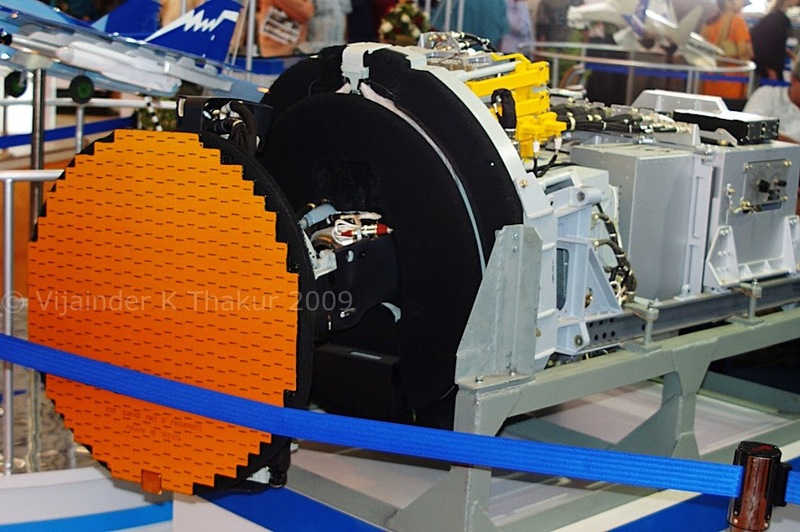 Zhuk-ME Slotted Planar radar fitted on IAF MiG-29 fighters. Planar arrays use an array of very simple slot antennas. They achieve their focusing effect by introducing and manipulating a time delay into transmissions from each antenna. A complex network of microwave waveguides on the rear surface of the array is used to achieve this. The controlled time delays result in a desired fixed beam shape with much smaller sidelobes compared to a concave reflecting antenna. The key to slotted array antennas is the time delay caused by waveguides. The signal that they transmit is in phase. Since a planar array antenna is a flat plate, it tends to act like a flat panel reflector to impinging transmissions from hostile radars and thus produce a lower radar signature than a concave antenna. However, mechanical steering of planar array antennas continued to be a problem. 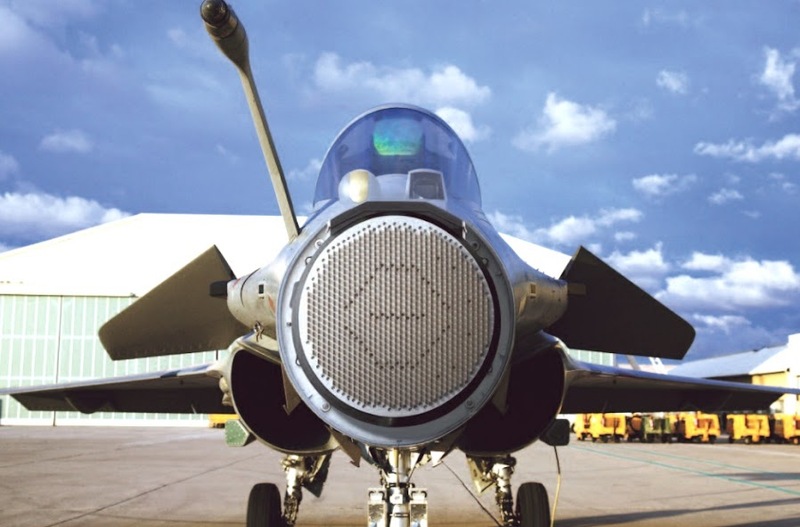 The Zhuk-ME radar developed by Phazotron-NIIR design burea and fitted on the MiG-29 is an example of slotted array antenna radar. Similarly the AN/APG-65/73 radar fitted on the F/A-18A and the APG-66 radar fitted on the F-16A are slotted array radars. The key to improving radar capability lay in electronic steering of the radar beam a technique that first began to be employed in ground based anti missile radars in the 1970s. Such radars employ a group of antennas in which the relative phases of the respective signals feeding the antennas are varied in such a way that the effective radiation pattern of the array is reinforced in a desired direction and suppressed in undesired directions. Such radars are referred to as phased array radars, since they employ an array of antennas that work using a shift in the signal phase. By the early 1980s the technology had been mastered to an extent where it could be employed in airborne radars. Electronic steering and shaping of a beam provides unprecedented beam agility - beam shape and direction can be digitally controlled by a computer within a matter of tens of milliseconds. Such beam agility makes it possible for one phased array radar to act as multiple radars each with its own beam shape and scan pattern! This is referred to as interleaving radar modes. The same radar can be tracking for airborne threats using one beam shape and scan pattern while searching for ground targets using another beam shape and scan pattern. The Russian NIIP N-011M Bars radar fitted on the Su-30MKI is a phased array radar. The B-1B Bone has flown since the 1980s with an AN/APQ-164 radar, fitted with an electronically steered array. The B-1A Batwing also exploits this technology in its AN/APQ-181 multimode attack radar. Phased array radar, also referred to as passive array radars, represent a big leap forwards. Using beam steering they provide stealth, interleaving modes and reliability. However, the shift in phase of the radar signal comes at a cost. High-power phase control leads to losses in the signal and a consequent reduction in radar sensitivity. Typical total losses in early systems resulted in a factor of 10 reductions in radiated power; in modern systems these losses are still in the factor of 5 ranges. 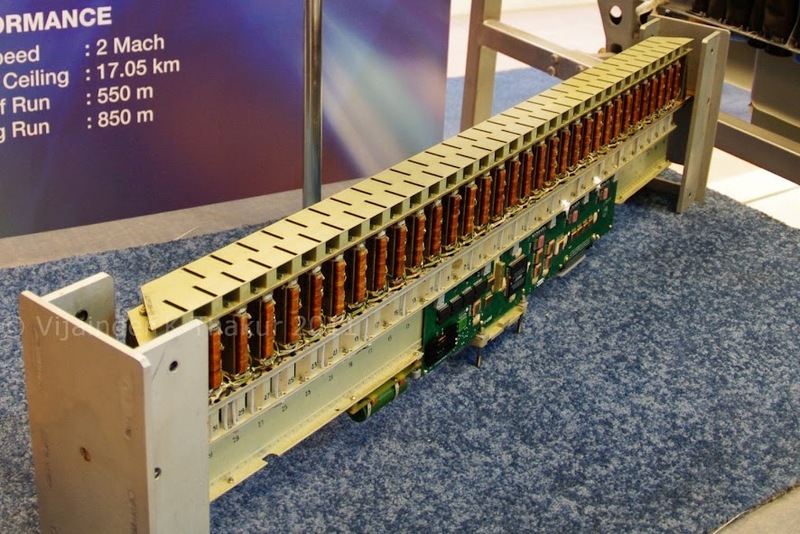 An Active Electronically Steered Array (AESA) takes the concept of using an array antenna a step further. Instead of shifting the phase of signals from a single high power transmitter AESA employs a grid of hundreds of small "transmitter-receiver (TR)" modules that are linked together by high-speed processors. Each TR module has its own transmitter, receiver, processing power, and a small spike like radiator antenna on top. The TR module can be programmed to act as a transmitter, receiver, or radar. The TR modules in the AESA system can all work together to create a powerful radar, but they can do different tasks in parallel, with some operating together as a radar warning receiver, others operating together as a jammer, and the rest operating as a radar. TR modules can be reassigned to any role, with output power or receiver sensitivity of any one of the "subsystems" defined by such temporary associations proportional to the number of modules. AESA provides 10-30 times more net radar capability plus significant advantages in the areas of range resolution, countermeasure resistance and flexibility. In addition, it supports high reliability / low maintenance goals, which translate into lower lifecycle costs. Since the power supplies, final power amplification and input receive amplification, are distributed, MTBF is significantly higher, 10-100 times, than that of a passive ESA or mechanical array. This results in higher system readiness and significant savings in terms of life cycle cost of a weapon system, especially a fighter. The use of multiple TR modules also means failure of up to 10% of the TR modules in an AESA will not cause the loss of the antenna function, but merely degrade its performance. From a reliability and support perspective, this graceful degradation effect is invaluable. A radar which has lost several TR modules can continue to be operated until scheduled downtime is organized to swap the antenna. AESA technology has not been easy to acquire. It has come from years of research and heavy investments. 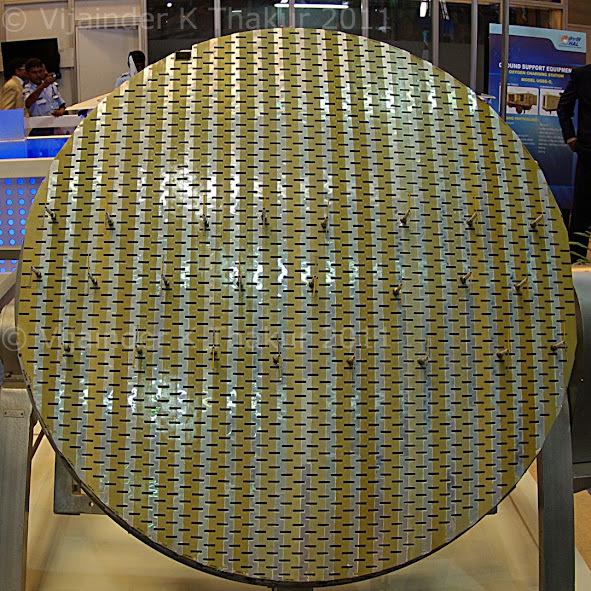 Improvement of gallium arsenide material and the development of monolithic microwave integrated circuit (MMIC) have been key enablers to the development of AESA technology. Two prominent early programs in X-band AESA technology development have been the Army family-of-radars program (which provided the basis for the X-band AESAs in the THAAD and GBR radars for theater and national missile defense systems, respectively), and the Air Force programs to produce X-band AESAs for the F-15 and the F-22. The investments in JSF radar technology have also fostered pivotal advances in reducing cost, weight, and mechanical complexity. JSF transmit/receive (T/R) modules are referred to as "fourth generation" T/R module technology. As can be expected, the technology comes at a cost. Each TR module is an independent radar. Initial cost of a TR module was reportedly around $2000. 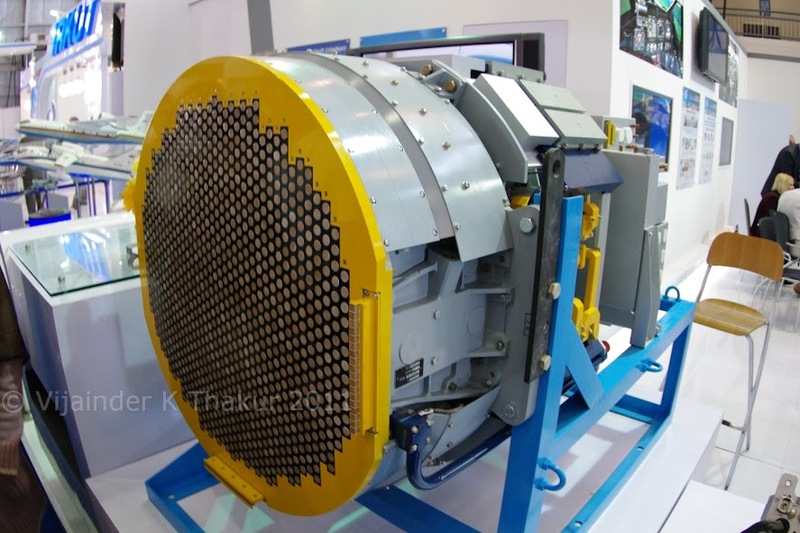 Fighter radars are usually in the 1000 to 2000 modules size range. In other words just the radar antenna could cost as much as $4 million. Building a Case for the F-35 by Trashing the Su-57? Should ADA Push LCA Navy Mk.2 Against IN Wishes, or Focus on the AMCA? Uri Attacks: India doesn't have a military option! Really?